I made this for the second time in 10 days just so I could show it to you. I mean, that’s just the kind of person I am, you know? I took this one for the team, but don’t get used to it or anything. Just kidding, dear readers – I would have made it again with or without you. It was that good. Actually, I have a confession regarding this one: I’ve never had kale before this. I know. I can’t believe it either. I know kale is having a moment right now, but I’ve always heard how bitter it is, and you have to cook it just so to enjoy it… and on and on and on. Aside from all that, though, we already like greens around here. I’m not exaggerating in the least when I say that I could serve only cooked greens to my husband for every meal and he’d be OK with that – we love collards, and spinach, and turnip greens and we eat them regularly, so I never saw the need to pick kale during my shopping. So what changed, you ask? Well, I sent Jacob to the store for salad – like spring mix, folks – and he bought me this. So I really had no choice but to cook it for dinner. And since I had no reliable recipe to fall back on, I just used the one on the back of the bag. And guys? We loved it. It’s basically just cooked down with a sort of semi-vinaigrette (I say semi because you use some chicken stock, and I’d never put that in a vinaigrette) and that’s it. I’ll probably make this one regularly with additions or subtractions as I have the time and/or inclination to play with it, but this one is definitely going to be a staple in our house, and I hope you’ll give it a try too. In a large stock pot, heat olive oil on medium high heat. Add onion and garlic; sauté until onion softens stirring often about 5 minutes. Stir in mustard, sugar, cider vinegar and chicken stock. Bring to a boil on high heat. Add kale, cover, and cook about 15 minutes stirring often. When liquid is reduced by about half and greens are tender, serve and enjoy. *The recipe also had the option to add 1/3 cup dried cranberries for the last 10 minutes of cooking and then sprinkle with sliced almonds when served, which I omitted due to the preference of my guest, but I’ll definitely give that a try next time. I love kale! I usually just blanch for a 30-60 seconds and then drain/squeeze it. Saute up with sauteed garlic, chili flake and maybe some lemon. Yum! I am always looking for new recipes to make with it though so I’ll have to give this a try. I’m definitely a fan now! 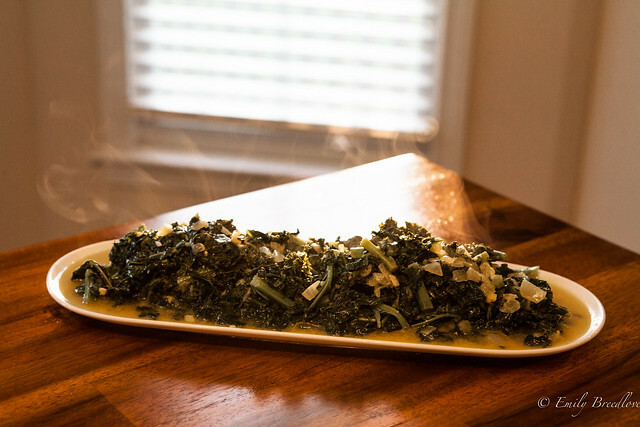 I’ll have to try yours as well – that sounds exactly like my sauteed spinach recipe.